ABP2000 Bulk Palletizer with a standard metal line of 151″ elevation, unless otherwise specified, with the following features. 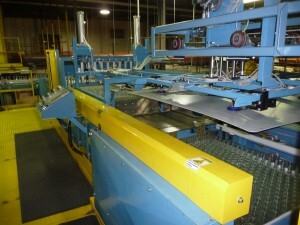 Automatic pallet dispenser, 22ft of empty pallet conveyor (top of chain height set at 24″ elevation unless otherwise specified), lower pallet squaring, tier sheet and top frame inserter, tier sheet and bottle squaring in elevator chamber, void eliminator side-rails on the accumulation bed, void detection on the accumulation bed, Allen-Bradley PLC control and touch screen PanelView operator interface, three full pallet discharge conveyors the first being 7′-6′ long with the second and third 5′-6′ long, unit comes with safety light curtains and also comes with one set of change parts (pattern forming bar / Note: additional tooling can be purchased separately). The ABP2000 Bulk Palletizer also has Rexnord 7705 matt chain on the accumulation and carriage sweep beds with Rexnord feathered chain on cross conveyor and LF chain on odd bottle return conveyor. Watch video below for ABP2000 Bulk Palletizer construction, installation and operation. Note: EMI can also offer full motion control for higher speed applications.